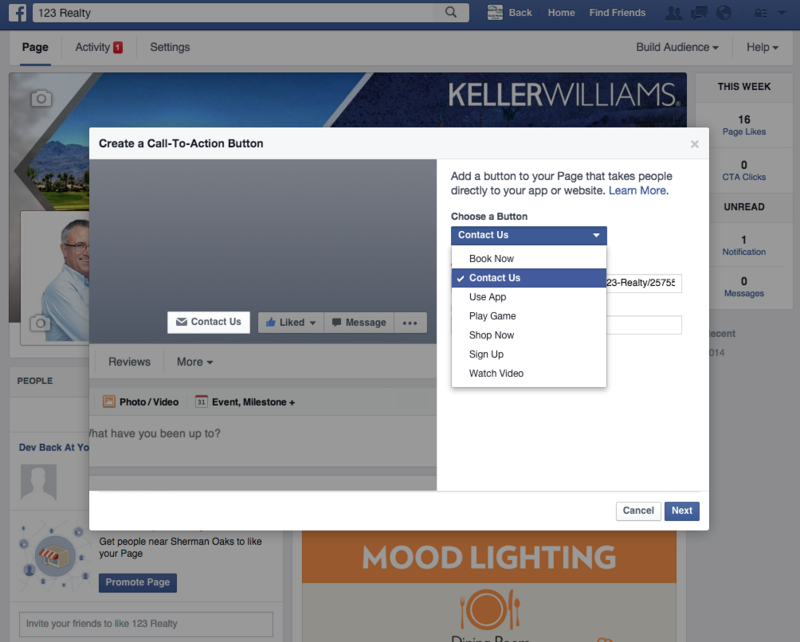 As you may have noticed, Facebook is experimenting with a new Call-to-Action button on business pages! They’ve been using these buttons on Facebook ads for awhile and after seeing some great Click-Through rates data, they want to give it a try on pages as well. 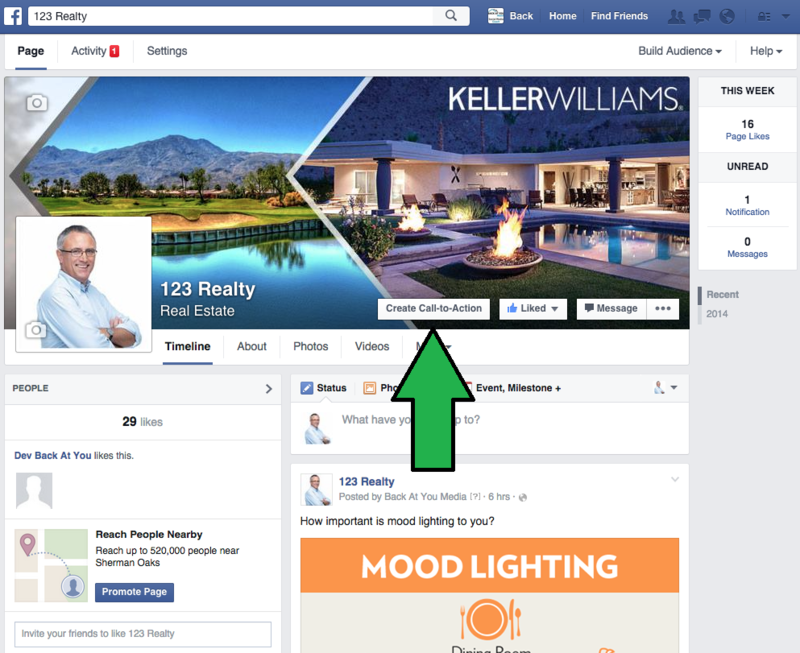 Let’s quickly review the available Call-to-Action button options and which will work best for the real estate industry. Next, Facebook will ask about some mobile preferences. Default settings will be fine for the majority of cases. Once you’ve specified your mobile preferences, click Save Changes, and you’re all set! Any future changes to the button can be accomplished by clicking the CTA button and then selecting “Edit Call-to-Action”. You can also see what a user would see by clicking “Go to link”. Lastly, in your notification area to the right of your cover photo, Facebook will start tracking how many people click on your CTA every week. -Book Now: Generally this would be used for hotels and other industries that require reservations. -Contact Us: This option is perfect for pages that are looking to get general lead information. When deciding on a website to use for this button, think about a straightforward contact form. For example, our Contact Us application! - Use App: For companies that have an app, this is obviously a perfect tool, especially for the mobile redirect and App Store options. If you have an app in the App Store and you think it’s important to your business and/or branding, definitely use this option! - Play Game: Unless you have developed some sort of Facebook/mobile game, this one is a no. -Shop Now: This one is interesting. The Shop Now option could be really useful if someone is looking to shop your listings right then and there. You could have the button go straight to the Featured Listings page on your website and people could jump straight there if they’re looking to buy. -Sign Up: This one could potentially be useful if you had a newsletter to sign people up for and a landing page where they could sign up. Otherwise, this may not be the best option. -Watch Video: This could be a great button even if you don’t have a video yet, you should create one! 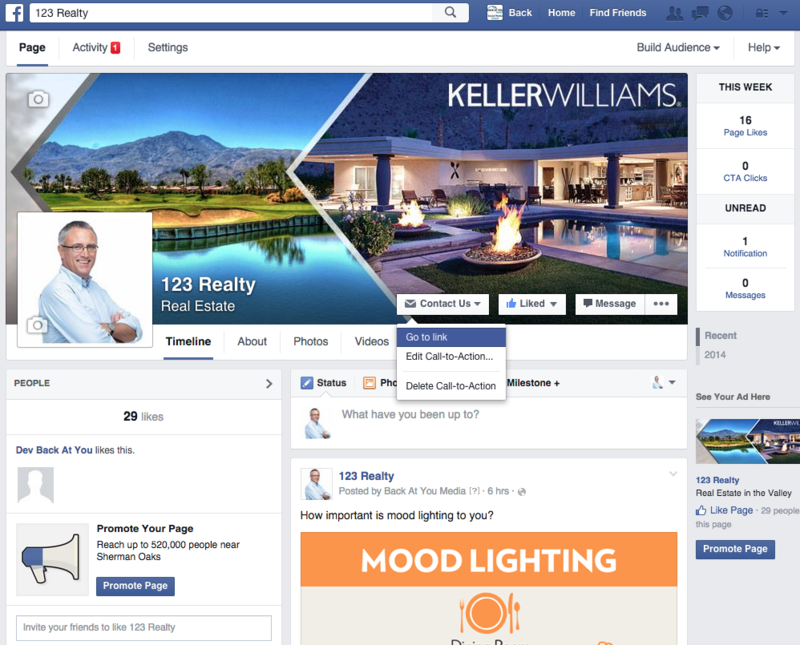 It may seem like a lot of work, but it’s a great value-add for your page and makes you appear very professional and tech-savvy to potential clients. So create a quick video about yourself or your team, upload it to YouTube or Facebook and then use that video link for the Watch Video CTA button so users can get a sense of your personality and expertise.